The project is originated as a tribute to Buenos Aires’ urban music and its culture. The building’s shapes and circulation are a balance between void and full, shaped by the rhythm of Buenos Aires iconic music and dance, the tango, and its popular instrument, the bandoneon. 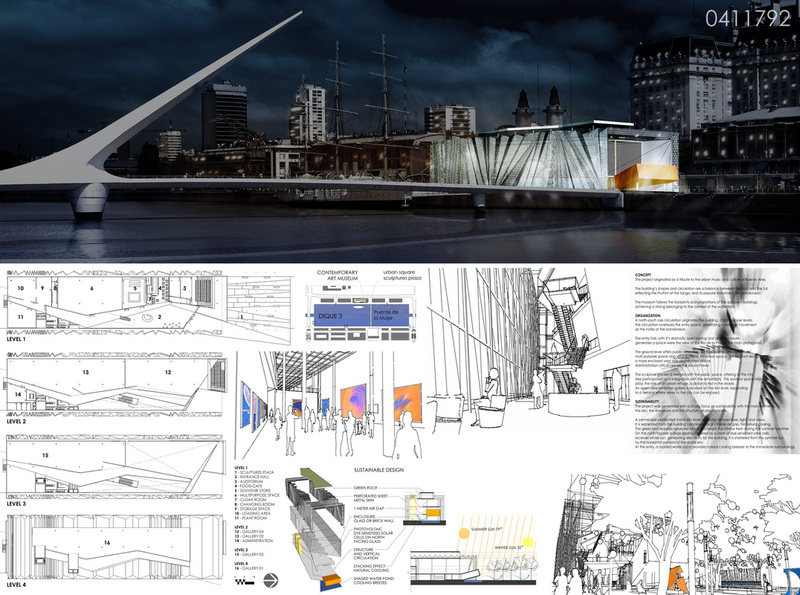 Puerto Madero, with its docks and the river, provides the perfect scene for the acquired building’s sense of strong belonging to the context identity. The museum imitates the shapes of the adjacent buildings, using the proportions as parameters to be part of the waterfront. The building originates from a main north-south axis of circulation. The circulation overlooks the entry space at each floor, generating a wave of movement as the notes of the bandoneon. The entry hall, with its ceiling open height and its glass enclosure generates a dramatic space were the view of the Rio de la Plata is the main protagonist. The ground level offers public amenities, such as auditorium, café, store, multi-purpose space and service areas. Exhibition spaces are located along a more enclosed west side and on the floors above. Administration offices are on the second level. The sculpture garden merged with the public space, offering to the city a free participation and integration with the art exhibited. The space generated by the sculpture garden plays also the role of an urban green space and a refuge to rest in the shade. An open view exhibition gallery is located on the last level, expanding to a terrace were views to the city can be accomplished. The project generates from a strong focus in sustainability. 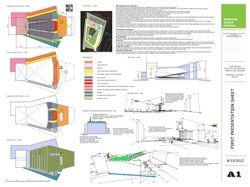 The main elements of the building, skin and structure, play a defined sustainable role in the complex. The main design element is a permeable perforated metal skin layer that regulates temperature, light and shade and allows a filtered view. As part of the main structure, a proposed green roof reduces rainwater runoff and keeps the interior fresh during hot summer weather. On the north façade a large glazing made of dye-sensitized solar cells receives winter sun, generating electricity for the building. The summer sun is sheltered by the horizontal portions of the metal skin on the north façade and on the roof. At the entry, a shaded water pond provides natural cooling breezes to the immediate surroundings. 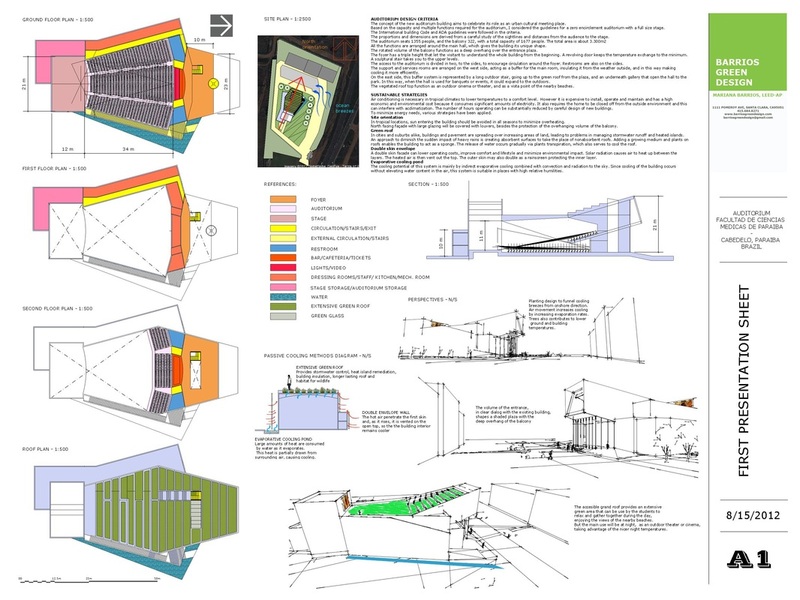 The concept of the new auditorium building aims to celebrate its role as an urban cultural meeting place. Based on the capacity and multiple functions required for the auditorium, I considered the guidelines for a zero encirclement auditorium with a full size stage. The proportions and dimensions are derived from a careful study of the sightlines and distances from the audience to the stage. All the functions are arranged around the main hall, which gives the building its unique shape. The vegetated roof top function as an outdoor cinema or theater, and as a vista point of the nearby beaches. Air conditioning is necessary in tropical climates to lower temperatures to a comfort level. However it is expensive to install, operate and maintain and has a high economic and environmental cost because it consumes significant amounts of electricity. It also requires the home to be closed off from the outside environment and this can interfere with acclimatization. The number of hours operating can be substantially reduced by careful design of new buildings. To minimize energy needs, various strategies have been applied. In tropical locations, sun entering the building should be avoided in all seasons to minimize overheating. North facing façade with large glazing will be covered with louvers, besides the protection of the overhanging volume of the balcony. In cities and suburbs alike, buildings and pavement are spreading over increasing areas of land, leading to problems in managing stormwater runoff and heated islands. An approach to diminish the sudden impact of heavy rains is creating absorbent surfaces to take the place of nonabsorbent roofs. Adding a growing medium and plants on roofs enables the building to act as a sponge. The release of water occurs gradually via plants transpiration, which also serves to cool the roof. A double skin facade can lower operating costs, improve comfort and lifestyle and minimize environmental impact. Solar radiation causes air to heat up between the layers. The heated air is then vent out the top. The outer skin may also double as a rainscreen protecting the inner layer. The cooling potential of this system is mainly by indirect evaporative cooling combined with convection and radiation to the sky. Since cooling of the building occurs without elevating water content in the air, this system is suitable in places with high relative humidity.